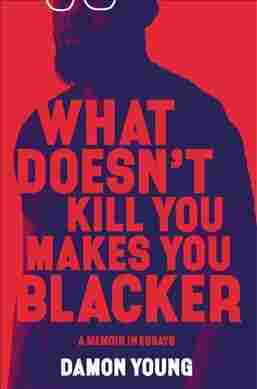 'What Doesn't Kill You' Navigates The Challenges Of Existing While Black Damon Young's new memoir is full of pointed, thoughtful, barbed and funny essays about the ways race has affected his life, and the lives of his family — and about his hopes for the next generation. Editior's note: This story contains a racial epithet. Damon Young says he's spent much of his life waiting to be called by a name we won't repeat, even though it appears in his new memoir — What Doesn't Kill You Makes You Blacker — a lot. His essays are pointed, ruminative, often barbed and funny reflections on how the fact of his skin color has posed particular lifelong challenges, questions, and anxieties. "My parents have this story about the time where they basically got into a race riot at this neighborhood deli in Pittsburgh, because the white boy behind the cash register called my mom and my grandmother niggers," he recalls. "Deli meats were thrown all over the place, windows were broken, olives were scattered, it was a mess. And so, this happened when I was maybe six or seven years old, and so my parents would tell this story at gatherings and at parties, and I wanted a story like that for myself, about a time where I was racially intimidated or that word was used against me, and I was able to defend myself ... and the book deals with similar sorts of anxieties and similar sorts of absurdities that just spring from this entire 'existing while black' experience." He's not just my dad, he's one of my best friends. He taught me to write — I remember when I was like in seventh or eighth grade, I would have these take-home essays I'd have to write for class, and he'd help me with them. I'd get A's — well, he would get A's, because he would basically write them, like, I wasn't getting the A's. He was getting the A's. And he would teach me these words like "behoove" and "cognizance," and these words that I would try to, in sixth or seventh grade, try to incorporate at recess, with minimal success. And so my dad has been this constant positive force throughout my life, and he still is. She had been a smoker for 30 years, and people know that if you smoke for that length of time, there's a higher likelihood that you will develop certain diseases. But I just think about, what about the environmental and structural and atmospheric forces that may have compelled her to smoke for that long? I think about the years before her cancer was diagnosed, when she would complain about back pain and stomach aches and headaches, and was going to the doctor's, and sometimes they'd give her Advil or tell her to get more exercise. It makes me wonder, you know, would they have taken her pain more seriously if she wasn't a black woman? And I am 95% certain that her race impacted her health, and also impacted how she was treated — but I'm not 100%, because you can't be. And that gap between the strong likelihood and the certainty, that gap is what drives people crazy sometimes. I played in high school, went to college on a basketball scholarship, and I still try to play as much as I can now. When I do find a good pickup game, you stick with that, and so there's one that I'm a part of, and the majority of the guys who come to this game, who frequent this game, are white, including one guy who is probably my favorite guy to play with. He's this great passer, great teammate — I also knew that he was not just a conservative but a pretty dogmatic Trump supporter. And so the week of the election, this game still went on. And usually for me, basketball is my, that's my release, that's my self-care, that's my catharsis. That's where I go and play and sweat and, you know, just go through this whole process of just feeling better. And so there's a chapter in the book that talks about just, I guess, the absurdity of attending that game that week, where it exists as a stress reliever, but then you're going there and playing with a guy who I know has contributed to the stress in an indirect way — and also the navigating and the negotiating that is almost mandatory if you're a black person in America. The whole chapter, at least the first part of the chapter is just ... me navigating how to give her all the good parts of me, while kind of hiding all the bad parts, and hoping that the bad parts die with me. Wanting her to be discerning, but not so discerning and so thoughtful that she gives herself acid reflux, like I have. And then also recognizing that yes, she is black, but she is a black girl, which means she'll also have to contend with sexism on top of the racism, and that makes things even more difficult. You know, I think it ends on a hopeful note, because I look at her and I see my mom, I see my dad, I see myself, I see my wife, and it ends on the hope that yeah, maybe she will take the things that I believe are the good things from me, and the things that I believe are the good things from my wife, and the things that I believe are the good things from my parents, and be able to put those things together and succeed — whatever success looks like for her.